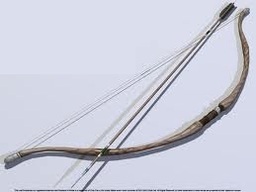 Made from a wood as white as snow, this bow is the standard of what beauty should be. Along the curve is carved 'Arcus Sanctus'. *Multi-Shot – Once per day, as a free action, you may target all your attacks to hit three enemies simultaneously in front of you. Given to Wolf by the Treebearer, Drake, it is likely that he has wielded this weapon over countless centuries, as it bears his true name, carved into the beautiful wood.